to have storm surges of 14 to 18 feet. Water was pushed up into the upper part of Narragansett, flooding downtown parts of Providence with water levels up to 13 feet. The storm killed approximately 100 people in RI alone. The Great Atlantic hurricane of 1944 was a category two/three by the time it hit Point Judith, RI on September 14, 1944. A total of 46 people were killed on land in New England. 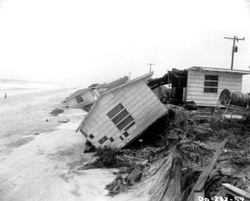 Hurricane Carol made it's landfall at high tide on August 31, 1954, creating storm surges of up to 15 feet. The storm surges flooded downtown Providence with 12 feet of water, and downed 95 percent of telephone service. The damage totaled up to about $200 million and there were 17 recorded deaths in Rhode Island. Hurricane Carol was classified as a Category 2. 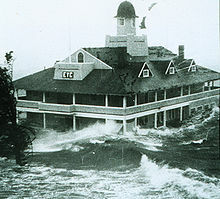 Although destruction was minimal in Rhode Island, mainly high winds and rain, Hurricane Edna struck only eleven days after Hurricane Carol (1954). Wind gusts were recorded at 110mph on Block Island, RI on September 11, 1954. Hurricane Edna was classified as a Category 3 off the coast of Cape Cod. 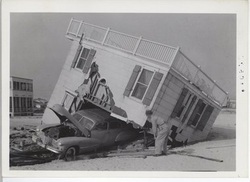 Like Hurricane Edna (1954), Hurricane Donna caused minimal damage in RI. Hurricane Donna reached RI on September 12, 1960 just off the coast. The hurricane reached Category 5 in some areas of the Atlantic, but was a Category 2 by the time it passed the RI coastline. 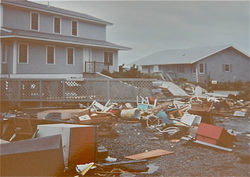 Hurricane Bob was a Category 2 and caused storm surges from five to eight feet along the Rhode Island shoreline. 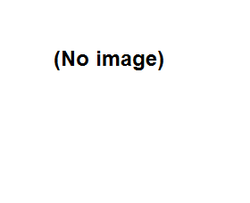 The highest amount of rainfall was 7.01 inches in Foster, RI. 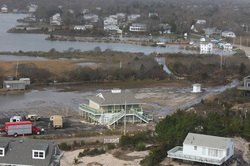 Hurricane Bob caused extensive beach erosion in Westerly, RI, and 60 percent of all Rhode Island residents lost power. Although actually considered a tropical storm, Irene caused more than half of Rhode Island families to lose power. Though the actual destruction was minimal, Hurricane Irene snapped trees and threw boats all over. 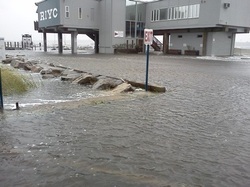 Some areas right on the coastline of Narragansett flooded because of storm surges. Classified as a Category 1, Hurricane Sandy caused extensive damage to Rhode Island, mostly on the coastline. Several buildings near the coastline were demolished, as well as a few boats. Beach sand was pushed up onto nearby roads and into buildings. As well as this, the sand dunes were destroyed and pedestrians were not able to access beaches and beachfront property because of downed trees, emergency personnel, and sand. Flooding was recorded, but most was not severely damaging. However, the shape of Rhode Island beaches were changed dramatically.